When you come to visit us you will notice that our church building is different from most American churches. The ‘Church’ in Biblical Greek is called the Body of Christ, or the People of God or the Saints (Holy Ones). People worship in a temple and that is the word we traditionally use for our church buildings. As a temple rather than a simple meeting place, St Nicholas Church building is designed primarily as a place of worship. Symbolically, an Orthodox temple represents the universe as oriented towards its Creator and united in thanksgiving. We face east (the orient), which is the customary direction of communal prayer towards God who is the source of all light. The scriptures are read and the sermon is preached facing westwards since “the people who lived in darkness have seen a great light” (Matthew 4:16 and Isaiah 9:2 ). As you enter you will see candles burning in front of pictures (icons) of Christ and the saints. People often light candles as they pray upon entering the church (Exodus 40:24-25 ). To the left of the candle area are two stands on which sit icons telling the story of the day’s Gospel reading or telling the story of the Church festival being celebrated. If we do not have a special icon for the day there will usually be an icon of Our Lord and God and Savior, Jesus Christ. If you continue to look to your left you will see a big icon of the Resurrection. This icon shows Our Lord raising the dead. He is grasping the hands of Adam and Eve and around Him the Old Testament prophets and John the Baptist are awaiting their own resurrection (1 Peter 3:18-19 ). If you look to your right, you will be able to see into the body of the church. One of the first things you will see is a frame holding up icons in front of the altar. This is called the iconostasis. The open space in the middle of the iconostasis allows us to see the altar. If you come during services you will be able to look in but if you come when there are no services a curtain will be drawn across the opening (2 Chronicles 3:14 and Ezekiel 44:2 ). A low door with icons of the four evangelists will be on the outside of the opening. This is to symbolize that when there are no opportunities to worship publicly we can still meet Jesus in the Holy Scriptures (John 5:39-40 ). This open space is called the Royal Door because the priest will come out from this door to read Christ’s words and give His Body and Blood as Holy Communion (Hebrews 10:19-20 ). The iconostasis is a pictorial representation of the “Cloud of Witnesses” in the 11th and 12th chapters of the Epistle to the Hebrews. On the top row of the iconostasis are the Twelve Apostles who are the foundation stones of the New Jerusalem (Revelation 21:14 ). Each of the Apostles carries a book or a scroll showing their preaching. On either side of the Royal Doors are images of Christ. To your left is Christ as He first appeared on earth as a babe in His Mother’s arms. The image of Christ to your right shows us Our Lord as a grown man. He is blessing us and is holding a closed book. The closed book reminds us of the urgency of Judgment (Revelation 20:11-12 ) but Christ is standing not sitting. He is not in the posture of a judge and His arm is outstretched in blessing. This icon primarily is reminding us of Jesus’ first sermon in Nazareth (Luke 4:17-22 ). In the synagogue Jesus first read from Isaiah’s scroll (Isaiah 61:1-3 ) and then he closed it and announced that we are experiencing the “acceptable year of the Lord”. This icon tells us that the Gospel is still being preached, captives are still being released, and the blind are still being restored to sight. The icons of Christ are always labeled ICXC which means Jesus Christ. The halo behind his head contains a cross on which is always written ‘I AM’ in Greek (Exodus 3:14 ). The human man who spoke in the synagogue at Nazareth is also the God of Exodus. 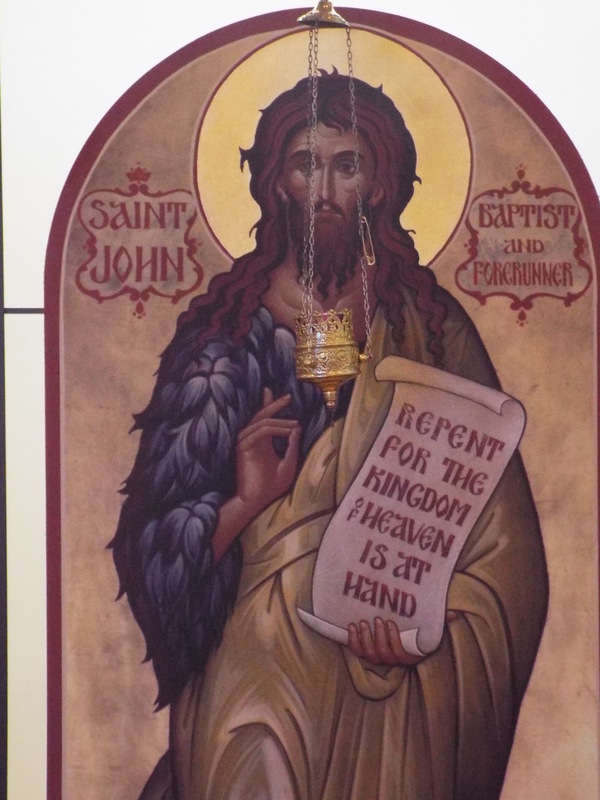 To the right of the icon of Christ with the closed book is St John the Baptist, the greatest of the prophets. He is carrying a scroll reminding us to “repent because the Kingdom of Heaven is at Hand” (Matthew 3:1-3 ). The icon of Christ’s Forerunner also reminds us of John’s message (Luke 3:7-20 ). 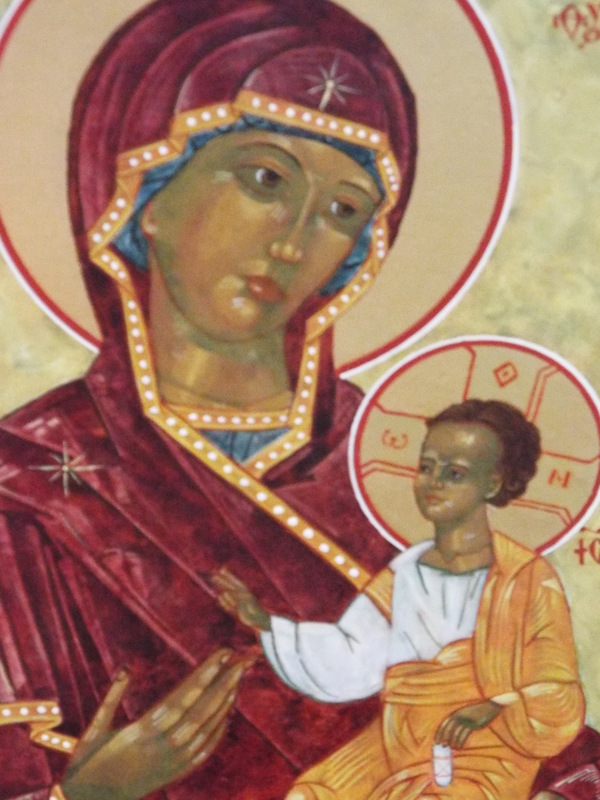 To the left of the icon of Christ as a child in His Mother’s arms is St Nicholas. 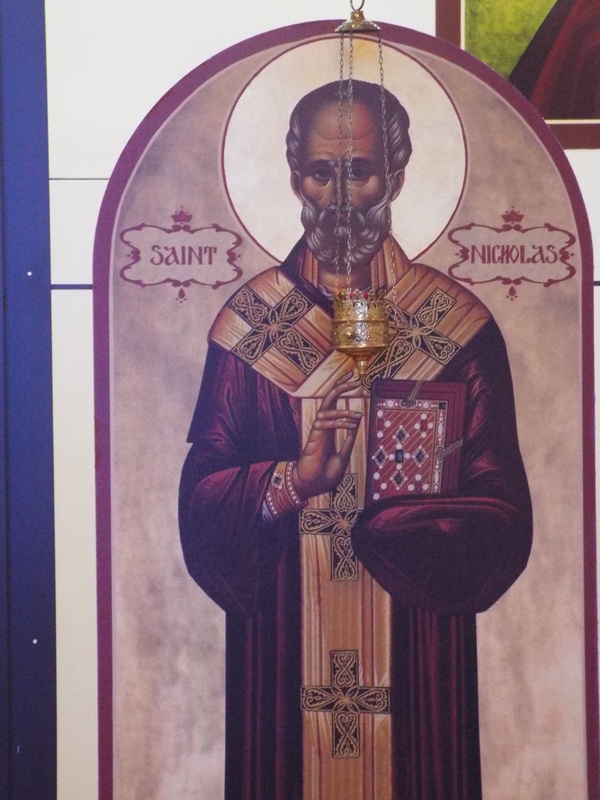 St Nicholas is our parish patron but his icon appears on almost all Orthodox iconostasis because he is a “rule of faith” as our hymns put it. St Nicholas was a great friend of the poor and an enemy of those who denied Christ’s divinity. The next two icons are of SS. Michael and Gabriel the Archangels (for Michael see Daniel 10 ; Jude 1:9 ; Rev. 12:7 and for Gabriel see Luke 1 and Daniel 8 and Daniel 9 ). They are painted on these doors because the altar servers who typically use them are like angels (messengers) who serve God’s purposes in a less exalted fashion than that of offering Christ through the Gospel and Holy Communion. 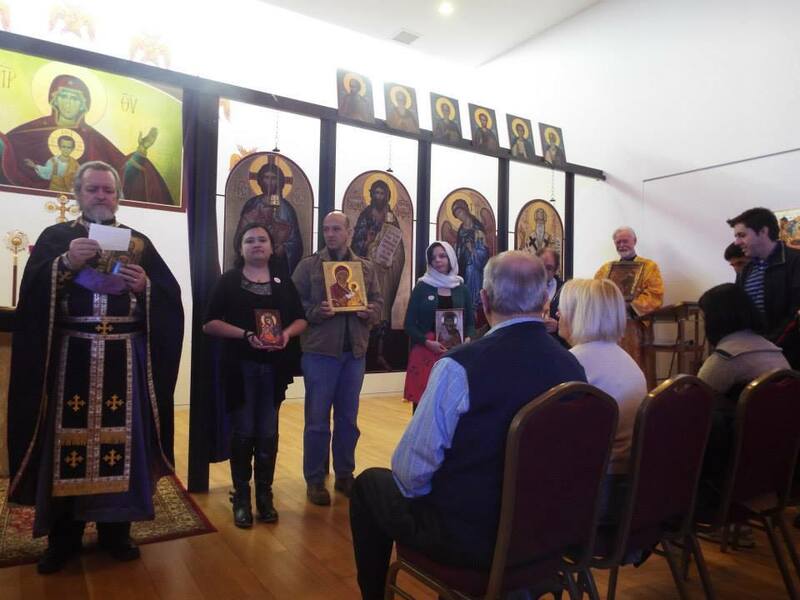 The last two icons are very important figures in our own Antiochian Archdiocese of North America. To your right is St Ignatius of Antioch who was a disciple of St John the Evangelist and an early martyr in Rome. His writings are the most important expressions of Christianity in the years immediately following the deaths of the Twelve Apostles. 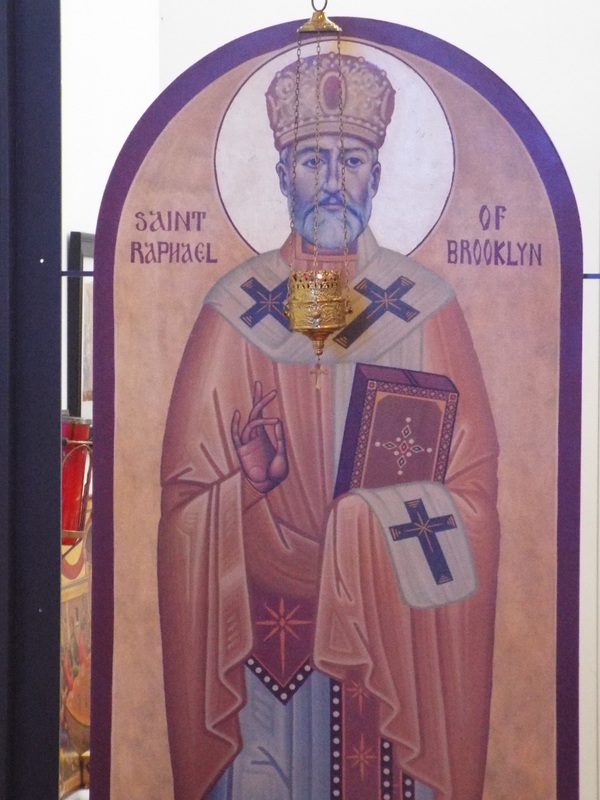 To the left is St Raphael of Brooklyn. St Raphael was born in Damascus and was the first Orthodox bishop consecrated in America. He served as a missionary in Central Asia, established thirty parishes in the US, and was the founder of our Archdiocese. Inside the altar area is a large icon of Mary with Jesus. This is called ‘Our Lady of the Sign’ referring to Isaiah 7:14 . It is also called wider than the heavens because the Son of God who cannot be contained by the heavens was contained in the Virgin’s womb (1 Kings 8:27 ; 2 Chr. 2:6 ; 2 Chr. 6:18 ). 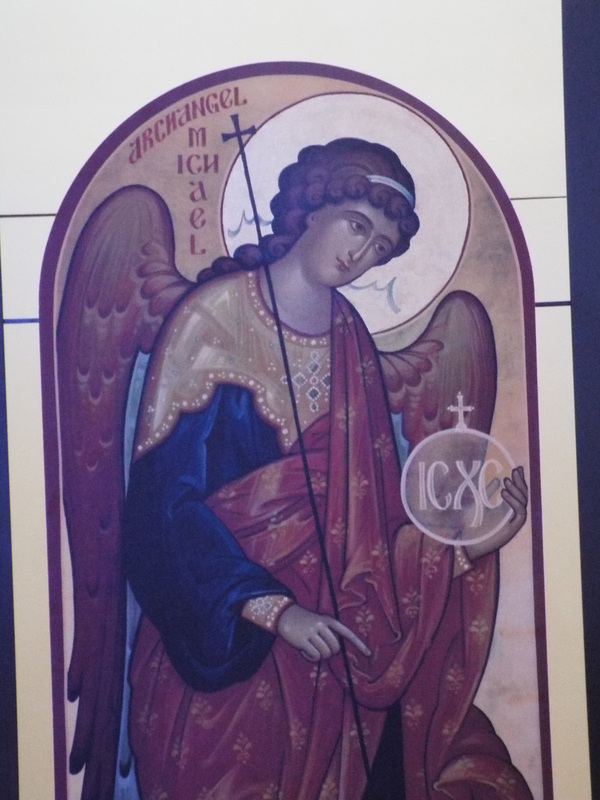 Images of Cherubim are pained around this icon. Cherubim are described as angelic beings in the Bible that God rests or rides upon (Psalm 17 Septuagint/18 Masoretic and Psalm 103 Septuagint/104 Masoretic ). In the Orthodox Church we use the Septuagint (Greek) Old Testament because it is the Old Testament quoted by Christ and the Apostles in the New Testament and because it is much older than the Masoretic (Hebrew) version which was not codified until the 7th through 10th centuries. Mary is described in Orthodox Christian worship as “more honorable than the cherubim” because God was inside her and took his physical nature from her whereas God only ‘rides’ upon the cherubim. As you enter the body of the temple moving towards the iconostasis through the center aisle, you will see a large icon on the ceiling. 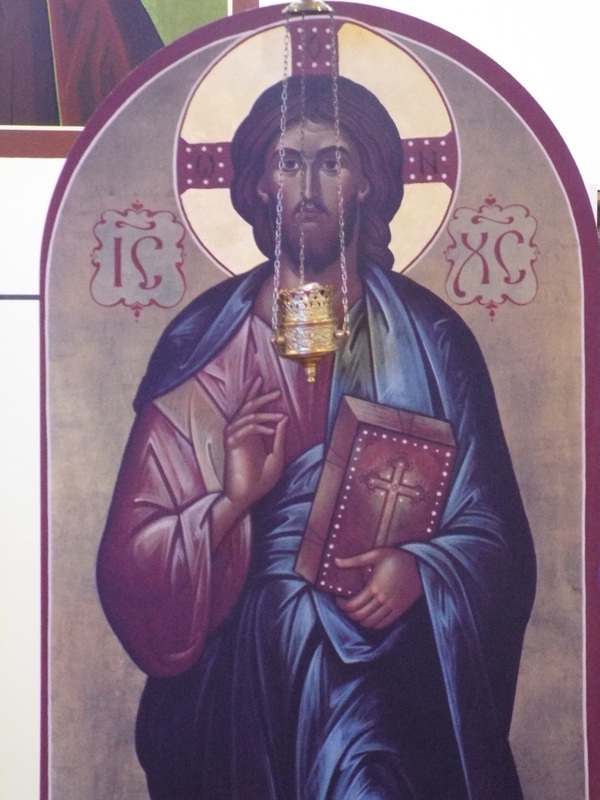 This icon is called Christ Pantocrator, or Christ All Mighty. This shows Christ as Creator and King of the universe. He is surrounded by angels to show that He rules not only the physical but also the spiritual world. The physical structure of St Nicholas Church is an award winning design by Marlon Blackwell of Marlon Blackwell Architects who was a Professor of Architecture at the University of Arkansas. The remodel was done by Lourie Construction, LLC. For more information the transformation from a garage to an Orthodox Christian temple, please follow these links.